Peugeot UK has welcomed the new set of CO2 targets for light commercial vehicles agreed by the European Parliament, safe in the knowledge that its fleet of efficient HDi-powered vans already meets the initial target, set for 2014 and Peugeot’s smaller vans even come under the longer term target, set for 2020. The targets will be gradually enforced over the next decade, with manufacturers expected to have 70 per cent of their van fleet emitting 175 g/km CO2 or less by 2014. This increases to 75 per cent the following year, 80 per cent by 1016 and 100 percent from 2017. Thanks to Peugeot’s ultra-efficient Euro 5 HDi engines, the 207, Bipper and Partner van ranges already offer models well below the ‘longer ‘term’ target of 147 g/km CO2, which is set for introduction in 2020, subject to a review in 2 years’ time. 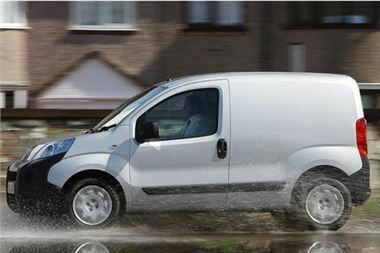 These big-selling clean and economic small vans help bring the overall fleet figure well within the 2014 target. The Peugeot 207 van has unladen emissions figures of 110g/km CO2 from its HDi 70 FAP engine and 115g/km CO2 from the more powerful HDi 92 diesel engine. The Peugeot Bipper has a new 1.3 litre HDi 75 diesel engine with Stop and Start technology, which gives it an unladen emissions figure of just 109 g/km CO2 and fuel economy of up to 68.2 mpg, with an EGC gearbox. The larger Partner, with its HDi 90 FAP diesel engine, also comes under the 2014 limit, with CO2 emissions of 140 g/km. This will reduce significantly in April with the introduction of a Stop and Start Partner, which has emissions of 129 g/km. Later in the summer this will be pushed down yet further with the addition of an electronically controlled manual gearbox(EGC) to the Stop and Start Partner for even greater fuel efficiency. This model will emit just 124 g/km CO2. As well as employing a combination of Stop & Start technology and EGC gearboxes to optimise fuel efficiency, reduce noise and emissions, Peugeot is phasing in Euro 5 FAP engines right across the range, helping reduce running costs and bringing even its largest Expert and Boxer vans right up to date with regards to tailpipe emissions.